Two towns and former county seats were abandon because they were bypassed by the Kansas City, Orient Railroad. Those towns were Stiles, Texas, former county seat of Reagan County, and Upland, Texas, former county seat of Upton County. The late Fush Patterson of McCamey, Texas once told me that he had lived in both Stiles and Upland and me that he hoped that McCamey didn't suffer the same fate. Stiles is near the intersection of Farm Road 1800 and Centralia Draw, eighteen miles north of Big Lake in north central Reagan County. Areas of massive limestone are found in and near Stiles. The area was on the Butterfield Overland Mail route in 1859-61 and was settled by sheep and goat ranchers in the 1890's. The town was named for Gordon Stiles, who donated land for the town site. William G. Stiles applied for a post office, which was established in 1894, and a store was operated nearby. Because it was the only town in the county Stiles was chosen county seat of Reagan County when the county was organized in 1903. In 1907 John Marvin Hunter began publication of the Stiles Journal, the first newspaper in Reagan County. By 1910 Stiles had a population of 191 and a frame courthouse. 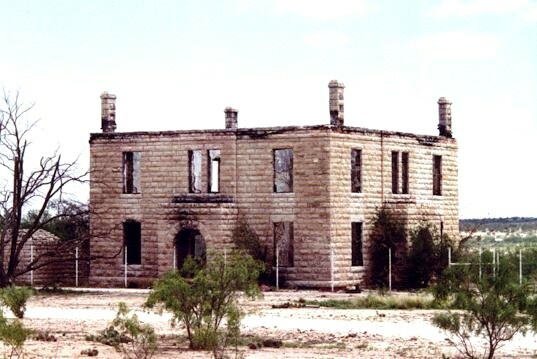 The following year William Martin, of Comanche, built a new courthouse with stone quarried from a hillside near the town. In 1911 the Kansas City, Mexico and Orient Railroad bypassed Stiles in favor of a route through Big Lake. The original survey for the railroad included Stiles, but the right-of-way was changed to the southern part of the county when a rancher refused to grant permission for the road to cross his land. After the discovery of oil at the Santa Rita oil well near Big Lake in 1923, Stiles began to decline. Following an election on May 28, 1925, Big Lake became the county seat. By 1925 the population of Stiles had fallen to seventy-five, and by 1939 the post office had been discontinued. From 1966 to 1990 the population was estimated at sixteen. Upland was located near the geographic center of Upton County northwest of the site of present-day Rankin. The town was platted by Henry M. Halff about 1908 and grew quickly to include numerous businesses, a church, and a school that began in October 1908. A post office opened in 1907 with Edward B. Coatwright as postmaster. To encourage development, Halff sold both businesses and residential lots and built a hotel and a general store. Future prosperity seemed assured when Upland was proclaimed the first county seat on May 7, 1910. Later that year W. D. Riser established the Upland Roundup, the first county newspaper. But droughts, bad soil, and lack of adequate water sources hinted of impending disaster. The final blow came when the Orient Railroad built south of the town about 1911, causing many residents to leave. The hotel was moved to Rankin in 1912, and the newspaper followed three years later. In 1915 Rankin became the county seat. By the time the post office closed in 1918, Upland's population had dwindled to a few families. Nothing remained of the former county seat by the 1980s. T. Lindsay Baker, Ghost Towns of Texas (Norman: University of Oklahoma Press, 1986). J. L. Werst, Jr., ed., The Reagan County Story (Big Lake, Texas: Reagan County Historical Survey Committee, 1974). Nancy Ethie Eagleton, On the Last Frontier: A History of Upton County, Texas (El Paso: Texas Western Press, 1971).